Never heard of Niue (pronounced “new-ay”)? I didn't know about this island country either until about 2 months ago when I booked my trip there. Niue is a tiny little island in the South Pacific—and it’s so special you’re going to be longing to go by the end of this post. People don’t come to Niue for its beaches and resorts—there’s only one sandy beach and one resort there! Instead, the few visitors to the “Rock of Polynesia” fly there for its exceptional diving and snorkeling, its unbelievable geography and coastal views, and its vibrant culture and friendly people. Niue Island has 100-meter visibility underwater just off its rocky shoreline because of its unique geography. Niue is a coral atoll, the result of tectonic plates pushing up this 100 square mile chunk of coral reef straight out of the water. Other than the depression at its center which used to hold a lagoon, the island has no rivers and it filters all rainwater through its limestone coral base. This results in no runoff to cloud up the surrounding waters. Whether a diver or a snorkeler, you’ll get crystal clear displays of colorful reef and marine life all year round. Our first evening in Niue, I went to watch the South Pacific sunset and was quickly welcomed by a display of humpback whales breaching in the distance. As a coral atoll, Niue Island has sheer drop-offs underwater within 50 meters out from the shore. This means the water is deep enough for all of the big marine animals to swim within view from the coastline. It was almost difficult not to see them during our stay. I saw whales every single day and heard them singing every time I dove underwater. The whales migrate to Niue from the South during the months of June to October. Sheltered by the island, they give birth to and nurse their calves. Niue is one of the only locations in the world allowing tourists to take a boat ride out to them for a chance to swim right next to these giants. Along the way, spinner dolphins are likely to follow and play with the boat. If you’re lucky like I was, the manta rays will also be jumping around nearby. Against the backdrop of coastal caverns and clear sea water, this marine display is a sight you won’t get anywhere else in the world! Ever taste that canned or bottled coconut water in the store? Most people don’t like it. Admittedly, I used to drink it regularly. But I can’t imagine ever going back to the store bought stuff after drinking from the coconuts on Niue. What I had there was the freshest coconut water I’ve ever tasted. The locals taught me which ones are the best to pick and how I should open them. Soon, I was grabbing them out of the trees, chopping them open, and slurping them down like a pro. Every day I had sweet, fresh coconut water bursting from its shell like a potassium-infused fire hydrant. Nom! I’m salivating just thinking about it! I know I say it a lot on this blog—people have been so friendly everywhere I go (except that one time)! But the people on Niue Island take it to the next level. The locals are incredibly eager to meet you, greet you, and help you enjoy their little slice of paradise. There was not one person I met who gave me the sense that I was not welcome. Everybody smiled and waved as I passed, offered advice and information freely, and volunteered to help out even when I didn’t ask. When I asked why, “It’s the Niuean way!” they said. Airfare - Air New Zealand was featuring a sale on flights from Auckland to Niue--$219 NZD one way. With the exchange rate conversion the round trip flight cost me about $280 USD (unfortunately, I didn’t have AirNZ Airpoints to cover this trip!). Accommodation - While you can splurge to stay at the only resort on the island (Matavai), I found accommodation at Kololi Guesthouse for two at $55 NZD per night for the room. Niue currency is the New Zealand Dollar which means conversion rates continued to treat me well at $0.63 USD to the $1 NZD. There’s also a backpackers on the island offering rooms as low as $25 NZD per person per night. Activities - As a diver, I paid around $100 NZD per dive. To see the whales, it can cost between $130 and $150 NZD depending on the company. However, I easily could have been happy to snorkel the area (with my own mask and fins brought along) and watch the whales from the shore, saving on adding any other activities. My experience on Niue would have been incredibly fulfilling even without these additional experiences. Transportation - There's no public transportation on the island except for a shuttle service through the resort ($10 round trips). Jono and I used this a few times. Otherwise, the island is so small we could walk where we needed to go—or we hitched a ride! There’s no need to pay extra for a car, as locals will pick you up on the road sometimes without even putting your thumb out. If you want to rely on your own transportation to see some of the more distant parts of the island, you may want the convenience of a vehicle. Jono and I borrowed bikes through Kololi to see the East Coast. But a car hired for one day is inexpensive (about $50) and will leave you with plenty of time to drive the 40 minutes it takes to circle around the whole island! Food - The food on Niue does cost quite a bit since most vegetables, meat, and fruit are imported. With a little planning ahead, however, I was able to save tons. Jono and I brought what we would need for breakfast and snacks for lunch during the days. These packed items coupled with plenty of papaya (called “Pawpaw” by the locals), coconut water, and friendly local offerings meant we only bought food for maybe 6 meals in the 7 nights and 7 days we were there. With all of the extra activities included, plus airfare, accommodation, transportation, and food, I spent roughly $1000 USD total. Take away the extra activities and this trip would have cost me just over $500 USD. Amazing! 6. There are caves to explore. On land and underwater. ‘Nuff said. The geography doesn’t stop impressing on Niue. The limestone rock cliffs lining the circumference of the island are pocked with numerous caverns and caves to explore. There are several famous land-accessible caves—Vaila, Palaha, Avaiki—and then even more little ones to discover on your own. The most exciting experience for me was diving into an underwater cave. The underwater caves are only accessible with dive equipment and they don’t require a lot of effort to get to since they’re just along the edge of the island. In addition to the caves, there are plenty of tidal chasms, meandering channels, and coral pools to snorkel and dive into. If you look around the corner from Avaiki cave, you’ll have the chance to feel like royalty snorkeling the aqua blue waters of a lavish cave where Ancestor Niuean kings once bathed! 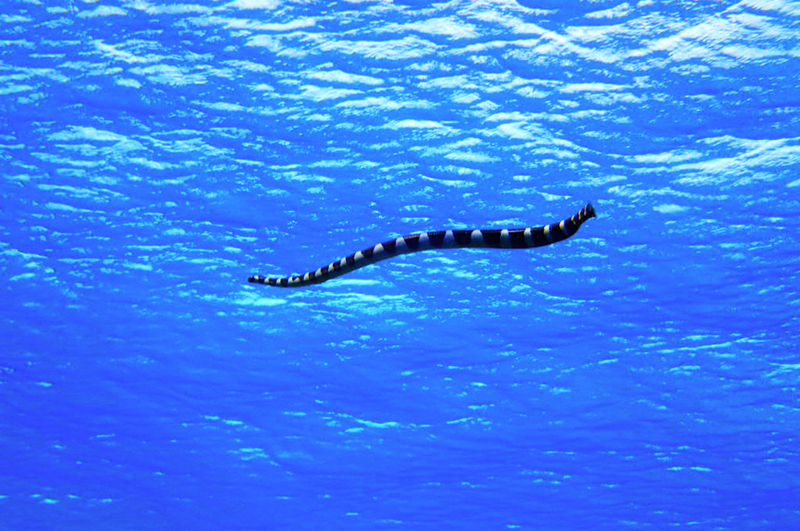 Niue is the only place in the world with banded sea snakes—called Katuali by the locals. They inhabit the island’s surrounding waters and caves. Katuali are beautiful and highly poisonous. One bite and you’ll be sent to your grave. They are not aggressive, however, just super curious! They fluttered their ribbon-like bodies over to check us out while we snorkeled and they tended to follow us around as we went SCUBA diving in Snake Gully. If you go diving, you may have the chance to visit Bubble cave where they like to breed. I got to see their babies! Niue comes with that typical laid back island way of life. You might be familiar with this if you have visited an island country or a state like Hawai’i in the past. Taking it up a notch, Niue was hit by a massive cyclone back in early 2004. Cyclone Heta destroyed much of its infrastructure at 5 times the country’s GDP in damages. While the deaths were thankfully minimal (2 on record), there were also many shells of homes left in the cyclone’s wake. Homes were blasted apart, roofs ripped off, and many people among the already diminishing population left to find work and support in Australia and New Zealand. What’s left now is a population of about 1200 mainly older Niueans living in patched up homes with few accouterments (typical even before Heta arrived). You’ll be comfortable during your stay since the resort and guesthouses were given the necessary attention to bring back the tourists. Outside of these places, however, you’ll notice homes with fabric in the place of proper doors, living areas with no TVs, and beat up cars from the 80s that somehow shockingly make it through New Zealand auto inspections. Niueans don’t need anything new or fancy to be happy. And, in no time, you’ll find yourself adapting to this way of life. Even the internet addicts out there will adapt. Amazingly, the island has free Wi-Fi access. It’s incredible the island has internet access at all, let alone free access—but it isn’t fast. The Wi-Fi will frustrate you with its slow speeds enough to make you put your phone down and go for a walk instead. After all, this is why you’re here! Get out there and connect with the island, its way of life, and its people. You’ll quickly find all you need to be happy is some sunshine, a dip in the Limu pools, and some coconuts and papaya for lunch. You’ll be as carefree as the dolphins you see playing in the waves! Unlike nearby Fiji and the Cook Islands, Niue may be one of the few island countries in the world that almost nobody else has been before. Even the regular travelers you know probably have never heard of Niue. There are two flights going in and out of Niue per week and they only leave from Auckland, New Zealand. Niue’s government estimates about 6000 people visit the country per year. The flight I was on during peak season wasn’t even close to being full. Many of the people filling the seats were Niueans returning to visit their home country. The rest were Australians or New Zealanders. So if you’re from Europe or the Americas, you can be pretty certain nobody you know has this country on their bucket list, much less has ever even been there! So, deviate the norm! Add this totally random country to your bucket list. And if you go, you’ll get to shock your friends and family with your worldly wisdom! This is just a glimpse at Niue Island. The stories I will share in upcoming posts about my experiences will delve even deeper. From receiving an invitation into a Tongan immigrant’s family home to listening to the sounds of humpback whales singing underwater—Niue captured some of my greatest travel moments yet! Check the blog next week, subscribe to the RSS, or follow me on social media to be sure you don’t miss out on one chunk of this paradise rock!